Die Screaming Marianne, Schizo, The Flesh and Blood Show – films that have a couple of things in common: they were all directed by Pete Walker and they all have titles that are better than the films themselves. That’s not the case with Walker’s Frightmare though – beyond the unhelpfully generic horror title lies a grisly Britsploitation gem. 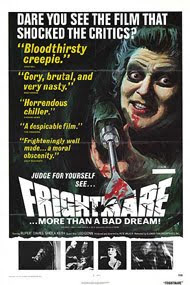 Frightmare’s the second of the mid-70s trio of films that makes up Walker’s finest work. On either side of it are House of Whipcord and House of Mortal Sin (it seems a shame that Frightmare’s title doesn’t continue the House theme – House of Mortal Remains would have been pretty appropriate). These are uniformly bleak visions of 70s Britain as a decaying society. I don’t know how much of their social commentary’s intentional and how much has been read into them by too-clever-by-half writers years later, but they all work as dark satires of the UK and its institutions. All benefit from intelligent, knowing scripts by David McGillivray (who also appears in them in brief cameo roles - he's a doctor in Frightmare) and the inspired casting of character actress Sheila Keith. Keith played the staple exploitation supporting roles of sadistic prison warder and sinister housekeeper in Whipcord and Mortal Sin respectively, but Frightmare sees her taking centre stage. She’s playing another stock exploitation character, it’s true – but a cannibalistic serial killer is not the kind of role normally played a genteel fiftysomething woman. It very much pays off though, as she gives one of the most remarkable performances in any British horror film. The first victim of Dorothy’s that we see is Andrew Sachs (a short while before achieving heavily-accented TV immortality) in a black and white prologue set very precisely on February 18, 1957. He pays a visit to fortune teller Dorothy’s hut and ends up with a nasty hole in the side of his head. Cut to a stern judge assuring us that Dorothy and her accessory husband Edmund will be kept in a mental hospital until they’re completely rehabilitated. The sinister music following this suggests that all is not likely to go to plan. A tarot card-based title sequence a bit like Tales of the Unexpected follows, and then we’re introduced to two very different sisters, Jackie (Deborah Fairfax) and Debbie (Kim Butcher). While Jackie enjoys herself at a jolly dinner party with friends, Debbie visits a dodgy nightclub (well, the dancing’s certainly dodgy) and ends her evening by enthusiastically assisting her boyfriend in beating up the barman (Michael Sharvell-Martin, the next door neighbour from 80s sitcom No Place Like Home). We soon learn that these are Edmund and Dorothy’s children (well, bloodthirsty Debbie is – Jackie’s from Edmund’s first marriage), and while Debbie thinks her parents are dead, Jackie knows better. They’ve been released with a clean bill of sanity and are living in an out of the way cottage – Jackie ventures there at night with mysterious bloody parcels for her stepmother. The performances in Frightmare are excellent all round. Especially brilliant are Rupert Davies (looking like a careworn Michael Winner) as the helpless Edmund, horrified by his wife’s activities but prevented by his love for her from doing anything but cover up her crimes, and Gerald Flood as the blasé psychiatrist who let the Yateses back into the community. Sheila Keith though, is just hypnotic throughout. She brilliantly communicates Dorothy’s insanity through showing the character’s different sides: Sweet, distraught old lady, callous harridan taunting her lonely victims, crazed murderer, and even white-faced, blood-drooling zombie in a highly disturbing dream sequence of Jackie’s. Frightmare’s commentary on the rehabilitation of offenders and the family unit is biting enough to entertain those who like a bit of substance to their films, and it’s gory enough for those who enjoy more straightforward horror. Something for everyone, in fact.